The items marked with the are the best Price Chopper deals in my opinion. Make sure you check off the items that you want on this list, then add your own custom items to make a customized shopping list. Please keep in mind that sale prices and even items can vary depending on your location. All Deals & Match-Ups are for the North East Area. It is always wise to know The Price Chopper Coupon Policy prior to shopping. Make sure to print off the coupons that are available on the Price Chopper Facebook page & Website or you can choose to load them onto your Price Chopper Advantage Card. Accepts SOME Competitor Coupons, See our Frequently asked questions, New Restrictions here! Will accept 4 manufacturer coupons of like items per day. so glad i found you!! thanks! Bayer 81 mg chewable aspirin is on sale for $1.94 minus $2.00 or $1.50 man coupons from past inserts = FREE or $.44. THANK YOU Jen!!!!! I am editing now!!! 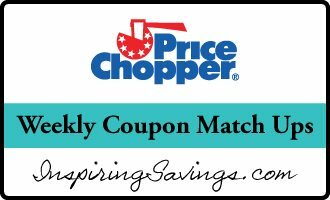 Can the Shop Rite double manufacturer’s coupons be used at Price Chopper? Do I have to spend $20 on unilever products to get the $7 oyno? I’d like to buy 2 axe deodorants and 2 packs of dove soap. The total before coupons but after sale prices would be $19.98. Close enough? I’ll check when I’m there. Thanks! Hi Tracy. The toaster Strudel coupons are weekly coupons that a published on Thursday as NEW. However just like many websites they are available for a limit amount of saves/prints. If you are not seeing it once you have logged into your account or created an account, then they have reached their weekly limit. I am sorry. I have marked them as NLA in the database and should be reflected as gone very soon. Hi Pat!! Yes there is a little pop up window (Should be lower right hand corner). That pop up you will be able to print your list, email list or sign into your favado account. However, Yesterday my site had a pretty big update and it seems due to this update certain tools are not working properly. I am in the mist of getting these correct. I am sorry for any issues this may have caused. Still no pop up window for me ….. is it just me??????? What pop up window are you looking for Pat? Ok, from this weeks ad-if the Pop Secret coupon says DND they will not double correct? The post above states it doubles. Sorry still trying to figure all this out. Great Point. If it the coupons states “DND” it may in fact double, based on how the manufacturer coded that particular coupon. But how do we know if it doubles or not? Either from past experience or by using my favorite coupon app. I would download the “Double Coupon” app from itunes or google play. This is a great app I know you will love as much as I do! The Oreos coupon from the Sunday paper is $1 off TWO, but the in-ad coupon is only for 1. If you buy 2 it would be 99c + 2.50 = 3.49 minus $1 coupon = 2.49 for 2 pkgs, or $1.25 each… Better to buy just one. Any other Oreo coupons out there? If you choose to purchase two oreo packages for this week’s sale. You would be buying ONE with the super coupon at $0.99 ea and the other would be regular price (thinking it is $2.50). Your total is correct at 3.49 minus that $1 off coupon. Paying just $1.24 ea. Now the choice is up to you. If your family LOVE oreos than of course go for buying both of them. It is a good price. If you all are occasional oreo eaters than the one at $0.99 is amazing.